Calla is caught off guard when she’s unexpectedly knocked to the ground in an incident she can’t quite explain, even though she was there when it happened. Equally as puzzling is the fact she seems to have agreed to dinner with a man who was there to help her after her fall, since she’s recently sworn off people in general. But when the two are sitting together at dinner, things really start to get strange. Valcas, her ‘date’, tells her to ‘RUN!” and run she does, and in short order the two are transported to an alternate time. 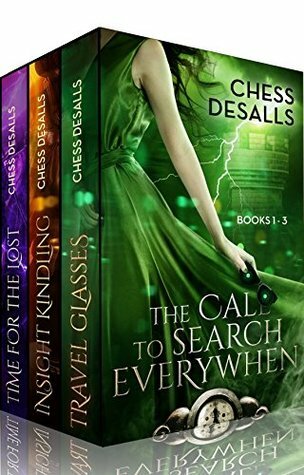 Thus, begins The Call to Search Everywhen series by Chess Desalls, an entirely gripping and utterly fascinating series of books. Each book builds upon another with mind-bending layers and a back-and-forth-through-time sort of continuum. With well-developed characters and a series of plots that keep readers coming back for more, The Call to Everywhen series is entirely addictive. As the story progresses past (and simultaneously future) events come together to make this imaginative series of books a sure favorite with fans of YA and fantasy fiction. Thank you for your kind and beautiful words. These books mean a lot to me, and I'm grateful for your review.